The NFA Review - What are these people planning? Why are they keeping it a secret? In the fight to improve the rights of gun owners, one can never be complacent. Gun owners must remain vigilant and push for as much information from government departments as humanly possible. I have determined today to refuse access to the requested information pursuant to the provisions of section 47 (3) (b), section 49 and Schedule 4, Part 4, sections (1) (a)and (b) of the RTIA. documents of an agency, disclosure must be given unless such disclosure would be contrary to public interest. The proposed National Firearm Agreement (NFA) update is currently an agenda item at the Law, Crime and Community Safety Council (Police Ministers and Commonwealth AGD). I have considered all the factors favouring disclosure and nondisclosure. particularly the factors in Schedule 4, Part 4, sections (1) (a) and (b). Dr Samara McPhedran, Australia's leading firearms researcher and chair of the International Coalition of Women in Shooting and Hunting (IC-WISH) has also submitted a RTI request to the Federal Attorney-General's Department, seeking the same information regarding the NFA review. Its no surprise to learn that Dr McPhedran received an almost identical response. The most damning section of the AG Departments refusal to disclose the information included this admission. A draft update to the National Firearms Agreement continues to be the subject of discussions between the Commonwealth and the States and Territories, and agreement on any update is yet to be reached. So in other words, they are going to make changes, but they will keep them quiet until after the election so as not to piss of the 1 million law abiding gun owners. It's too late for that, the 1 million lawful gun owners are already pissed off. We are sick of being treated like potential criminals. Can you trust a government that is secretly plotting against its citizens? The biggest problem we face is that politicians come and go, yet the faceless bureaucrats remain. We do know that the number of anti-gun public servants in the AG's department is astounding and their bias was made crystal clear during the recent senate enquiry into handgun violence. Their bias has also made Minister Keenan look like a complete fool with zero credibility. His department issued him with statements that are completely untrue. Perhaps Keenan will consult with some proper firearms experts in the future to avoid looking like a stooge that is being played to serve an anti-gun agenda. One must remember that the NFA is a non-binding document. It is not a law. The state governments are the major players here, as they define firearms legislation. If enough pressure can be placed on the states, they will have no option but to distance themselves from the review and reject it entirely. Its safe to say that here in Queensland, there will be a push to make changes to handgun legislation as they are already starting to reject new applications and renewals for primary producers. 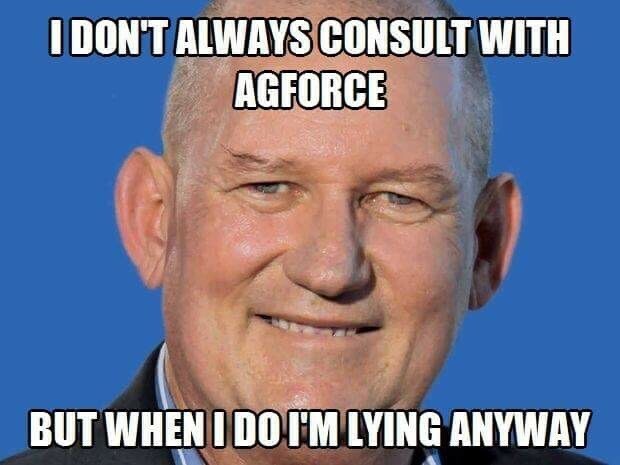 Police Minister Bill "Ratshot" Byrne knows this, because he is being played as a stooge in much the same way as Keenan was with the Adler shotgun. His recent comments about farmers using handguns were absolutely disgusting. He ought to be ashamed of himself, and those who elected him should be ashamed also. 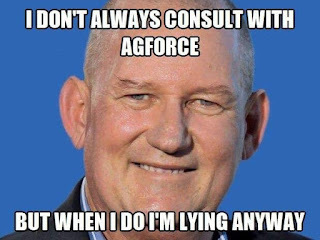 He deliberately lied to Parliament when he stated that he had consulted with AgForce Qld when there had been none whatsoever. Once again, anti-gun bureaucrats (in blue uniforms) are feeding ministers with misinformation. Weapons Licensing Branch are using outcomes from QCAT hearings as a basis to reject an application for a license. The police are hell bent on jamming through as many restrictions as possible on those that have proven time and time again to be law abiding. This means that police are dictating policy or quasi laws. This is why the authorised officers discretion must be removed from the act & regulations. No doubt they will try to introduce their unwritten policies into the NFA review. They need to be reminded that they are public servants and we are their employers. If they were doing the right thing, they wouldn't have anything to hide from us, yet they hide behind clauses in the FIOA & RTI legislation whilst preparing to bend us over the barrel all whilst laughing at us, the licensed law abiding shooters.